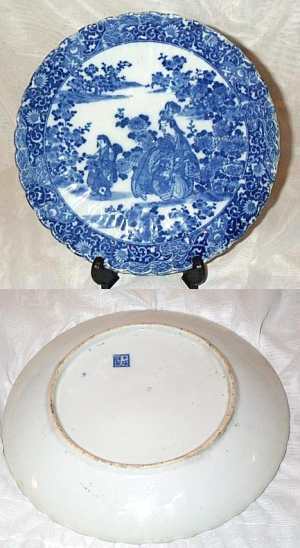 We were hoping that you would be able to help us with the origin and marks on this pretty blue and white plate. It is the size of a dinner plate and has a sort of ruffled or gently scalloped shape to it. We have tried to identify the marks from various references and are unable to find anything resembling it. The plate has quite a bit of age to it although we have no idea where it has been all these years. Hoping that you can help us and looking forward to your reply. Your plate seems to be Japanese and from the period around 1890 to the first decades of the 20th century. To make sure this is the case, you might want to take a close look at any solid blue area within the decoration. Possibly the dark areas of the rim decoration. If you look close at especially these areas, I think you will find some sort of textile pattern, instead of an even, solid area as if painted with a filled brush. If this is the case, this is because the Japanese around the turn of the century were experimenting with some kind of printing technique I unfortunately do not know that much about. Regarding the marks I would be happy to try to translate them, but will in that case need as sharp as possibly picture. Preferably, a direct scan. I hope this helps at least some.